EATON – Landon Eldridge let everyone know he was ready to play some football on Friday night. 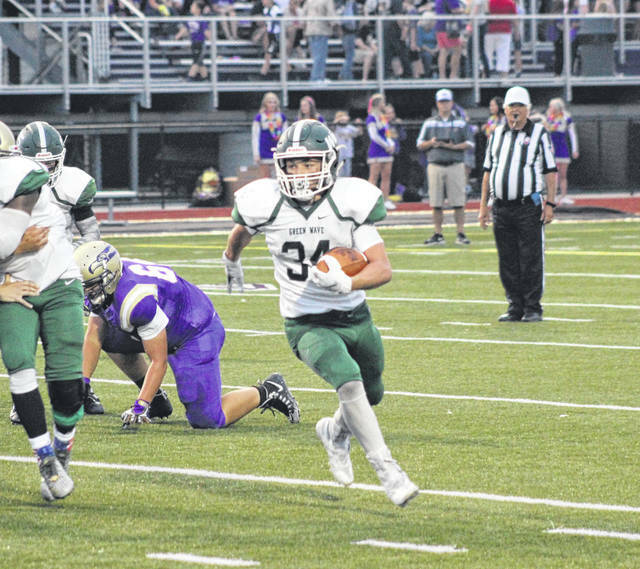 The Greenville senior running back rushed for 215 yards on 19 carries and four touchdowns in leading the Green Wave to a 40-7 season-opening win on the road at Eaton Friday night. Eldridge had rushing touchdowns of 29, 1, 55 and 6 yards in the game. He had three of his touchdowns and more than half of his total yards just in the first half. “I did not expect to come out and score four touchdowns and rush the way I did,” said Eldridge, who missed his entire junior year due to an injury. He also missed the last five games of his sophomore year because of an injury, so it wasn’t hard for him to admit to being more than a little excited to be out on the field Friday night. Eldridge got the Green Wave rolling at the 7:37 mark of the first quarter with a 29-yard touchdown run to put GHS up 6-0. Ethan Flanery’s PAT was blocked. On Greenville’s next possession, Tyler Beyke connected with Marcus Wood for a 34-yard touchdown strike and the Wave had a 13-0 lead. It was all Eldridge in the second quarter as he plunged into the end zone for a 1-yard score with 2:58 left in the first half. A quick three-and-out by the Greenville defense and the offense got one more chance before the break and Eldridge had his biggest run of the night for 55 yards and his third touchdown with 42 ticks left in the half. Eldridge unofficially had 143 yards rushing in the first half to go along with his three scores. “Landon ran the ball well tonight,” Greenville coach Aaron Shaffer said. “It was impressive. For a kid that has battled through some tough seasons to come out here and have that kind of performance is definitely nice to see. When he wasn’t handing the ball off to Eldridge, Beyke had a plethora of other weapons to choose from including Wood, Di’Maurye Ewing, John Butsch and Tony Sells. Beyke even had a few carries for himself to the tune of 68 yards. Wood was his favorite receiving target with 6 catches for 108 yards and a touchdown. Ewing was the second leading rusher behind Eldridge with 20 carries for 103 yards and the Wave’s final touchdown of the game, a 6-yarder late in the fourth quarter. The defense did its job as well holding Eaton to under 100 yards rushing as a team. The Eagles did manage to find the end zone, however. Trailing 33-0 in the third quarter, Tyler Gregory burst to the outside and went 50 yards for a touchdown. He was the teams’ leading rusher with 49 yards on just three carries. “It’s a good win for us,” Shaffer said. “It’s one week at a time though. We will enjoy this one for a few hours and then watch some film and be happy with the way we performed, but these kids and our coaches are hungry and they want to perform well every week. Greenville will host Stebbins in its home opener next Friday, while Eaton travels to St. Henry. This entry was tagged Aaron Shaffer, Eaton Eagles, Greenville Green Wave, GWOC, Landon Eldridge, Marcus Wood, Tyler Beyke. Bookmark the permalink.